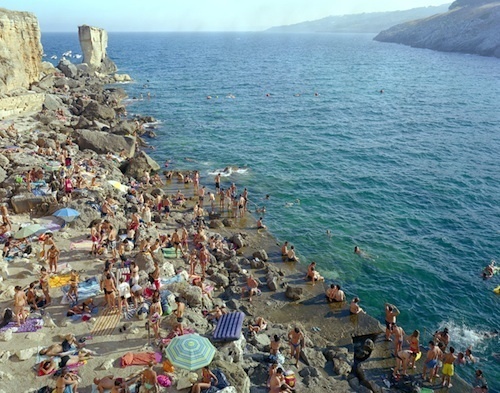 Massimo Vitali, Porto Miggiano, Italy (#4520), 2011, color photograph, 76 x 91”. The scale of the coastlines in Vitali’s enormous, saturated C-prints dwarf their fleshy inhabitants, creating a Where’s Waldo–type effect; a patient viewer is handsomely rewarded with a smorgasbord of candid moments between unknowing participants. The prints line the walls of the gallery on all sides, encircling a seating area that invites a leisurely look. It takes time to pick out what one might consider to be the “stars” of these scenes. In Les Catedrales, Low Tide, 2011, for example, a row of four intertwined visitors walk away from the knotted crowd, turning their backs on a pristine sea—three are dressed in identical white, flanked by an individual in a blood-red shirt. In Porto Miggiano, 2011, a white-haired man in neon-blue swimming trunks squats awkwardly on a rock. An inflatable blue mattress leans precariously on a nearby outcropping, out of place in the flesh-and-limestone landscape. It is interesting to compare this work to another piece of Vitali’s, which is not technically part of the exhibition but is on display in an adjacent room. Hubbubs of fluorescent jumpsuit–clad skiers brave the elements to chairlift up a groomed ski slope. As the skiers line up to ascend the little mountain, the presence of their bodies in nature implies a fragility entirely different from Vitali’s beach-dwellers—in the former, man attempts, awkwardly, to triumph over nature, while in the latter, man is happily subsumed by it.